And then hits you across the face with a pipe. 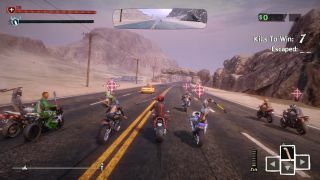 If you've been putting off having a look at Road Redemption—the spiritual successor to Road Rash that was Kickstarted back in 2013—because it's in Early Access then now is the time to give it a look. I had a play of the Early Access version recently, and had quite a good time. Randomized tracks make it impossible to learn layouts in advance and instead I just react to them, staying alert to sudden turns or detours full of power-ups rather than building up muscle memory, even though the tracks are obviously assembled from recognizable pieces like slot car tracks. And sometimes you get a weird one, like the time I got a warning about psychedelics being used in the area and then cars started falling from the sky, smashing into the bitumen as I swerved through a storm of shattering metal.